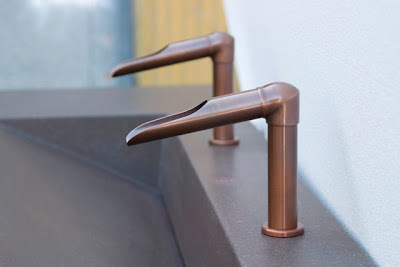 I mentioned Susan Palmer's Design Blog the other day, and last week they profiled some faucets from Sonoma Forge that stopped me cold. Sonoma Forge is a Petaluma, CA-based manufacturer of some truly beautiful fixtures. Their fixtures are available in a variety of finishes; from Oil-Rubbed Bronze, to Rustic Copper, from Rustic Nickel to Hand-Forged Brass. 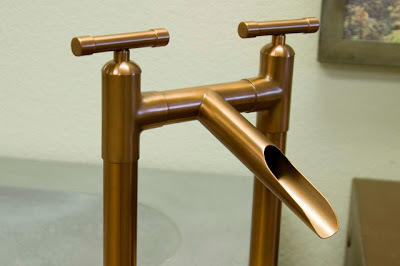 Of their finishes, Rustic Copper is the only one Sonoma considers to be a living finish. Technically not a living finish, Rustic Nickel will also evolve over time if placed outside, though nickel's not nearly so reactive a metal as copper. I wrote about living finishes in a series of posts back in February. If you need a refresher, you'll find the first in that series here. I corresponded a bit with Erik Ambjor, Sonoma's president last week. He gave me that information on the nature of their finishes. Another aspect to some of Sonoma's fixtures is a handle-free operation they call Sans Hands, and I had Erik explain that to me too. Sans Hands technology allows some of Sonoma's fixtures to operate without handles of any type. Rather than the hit-or-miss nature of electric eye and motion-detecting fixtures, Sonoma's Sans Hands operates invisibly. It sounds really complicated and high-tech but it's pretty simple. 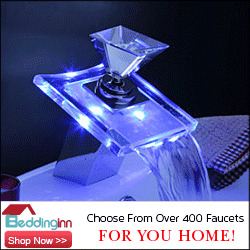 The faucet generates a small electro-magnetic field, hands near the field interrupt it and the faucet turns on. Pull your hands away and the field's re-established and the faucet turn off. It's pretty slick actually. 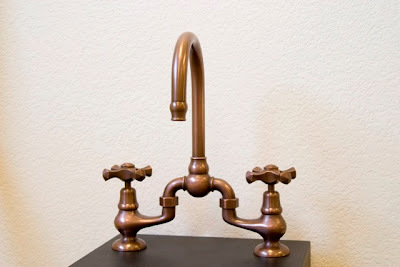 All of that happens automatically and Sans Hands faucets look like they work by magic alone. In addition to being thought through and engineered with something that borders on genius, they are also gorgeous. Some of them take a page from the traditional cut bamboo water spouts, some interpret classic American forms, some are sleek and timeless and some are art for art's sake. Spend some time on their website, you'll be as mesmerized as I was. Thinking about something new and interesting for an upcoming renovation? 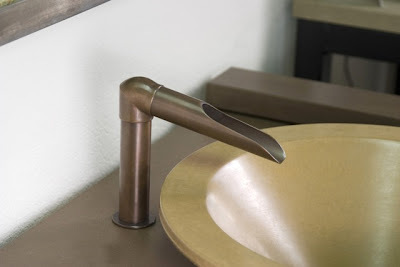 Sonoma's faucets and fixtures are available through dealers located across the US and Canada. 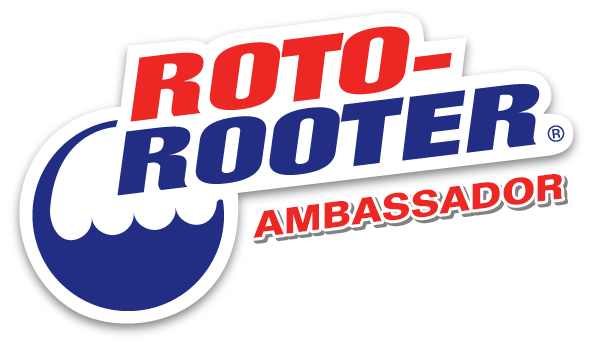 You can find a dealer who's local to you through their website. That is, if you can tear yourself away from the product photography. Hah! Notice too that a lot of these photos I'm showing today have some really cool-looking sinks along with them. 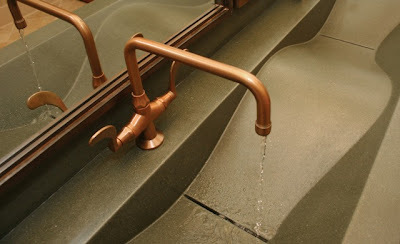 Well Sonoma Forge gets involved in cast concrete sinks and counters too. Tune in tomorrow to read all about them. 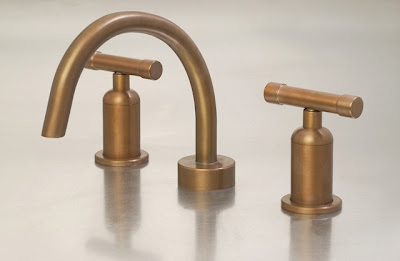 I picked copper faucets from their collection for your benefit Kelly. Check out their site, they have some really gorgeous stuff! Incredible. We used to frequent a little bar in Japan that had bamboo faucets like that and I just loved them. THis really puts me in mind of those. I'm really taken with that spout shape for the same reason Melody. I've been a fan of the hands-free faucet concept for a couple of years now. I just can't get past the temp control questions that never seem to get answered! Jamie, I can put you in contact with them and you can ask that question yourself. They are great folks, very personable. And as I understand it, the temperature is pre-set on these faucets.